Wind – Periods of heavy winds during emergence will cause spears to bend. Winds can cause one side of the spear to dry out quicker than the other causing the spear to bend and point in the direction of the prevailing wind. An asparagus planting is suffering from wind damage if most of the bent spear heads in the bed are pointing in the same direction (Fig.1). Figure 2. 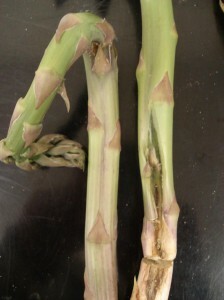 Mechanical injury on asparagus. Wounding causes spears to bend because one side of the spear stops developing. 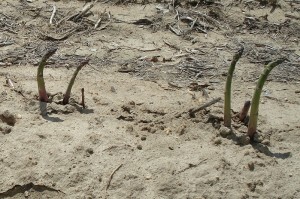 Stones/Rocky Soils – Asparagus grown in stony/rocky soils can suffer mechanical damage as spears emerge from the soil. Stones can cause mechanical abrasions on spears damaging epidermal cell layers as spears emerge from the soil. Spears with mechanical injury such as this will become bent or contorted with severe bends and may also develop loops as the side of the spear that was undamaged continues to develop (Fig. 2). Figure 3. The ‘nicking’ of spears by a knife during the harvest of other spears in the crown will cause spears to develop poorly and allow “opportunistic” pathogens to invade the spear. Other Causes – Spear damage can also result from feeding injury caused by cutworms, slugs and other insects. Insect feeding on one side of the spear will reduce the growth rate on the damaged side and causes spears to curve as the healthy side of the spear continues to develop. Occasionally curved or misshapen spears are observed with no apparent mechanical injury, insect feeding or disease. 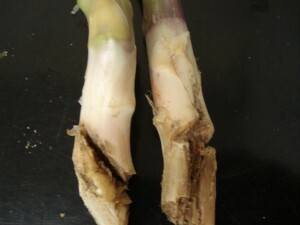 This damage may be due to unseen injury to the crown by cutting knives, crown rotting pathogens, or environmental stress such as overcutting (Fig.3).